Since I no longer have the same income I did a couple of decades ago, I’ve had to find more creative ways to fund my ski addiction. In the last 12 years I’ve had a couple of different gigs that allowed me to ski for far less than the average pedestrian pays. I’ve been a ski instructor, worked as a volunteer ski patrol, and last year I signed up to be a guide for visually challenged skiers. Yesterday I helped chaperone’s 30 students on a Mt. Hood Meadows ski outing – we have three more to go. I have over 200 days of skiing experience at Meadows, but I really haven’t been there since my exodus from Portland 12 years ago. What amazed most was how little the place has changed in 15 years. I suppose when you have a captive and growing customer base, you don’t need to invest a lot of money into your customer service or facilities. The day started early for me. Since we have just moved, I really didn’t know where my ski gear was (is?). So, I got up at 3am and started looking: going through at least 90% of the boxes in our garage. I found two books my wife wanted, the charger to the dust-buster, and the second strap for the high chair. But I couldn’t find the brackets for my ski rack or my ski clothes. Just when I was about to duct-tape the ski rack to the car, I looked over and saw a box I hadn’t searched yet. We were temporarily blocked by a wreck near the St. Johns Bridge, but we easily diverted across the bridge and took a long-cut through North Portland. Then we made two vain and one successful stop to buy some ski goggles, gloves, and long underwear. Finally arriving at Meadows around 11am, we were further delayed by some serious inefficiency issues on the part of their group sales department. We finally took our first turns of the day at 12:15pm. Despite 30 mph winds, blowing snow, and ice crystals ravaging our faces, the snow was great! One thing I’ve discovered is that if you want good snow on Mt. Hood, you’re going to have to endure a little, um, weather. The fog and blowing snow made it impossible to see the terrain details and therefor difficult to ski with confidence. Several kids abandoned all hope of skiing after their second run (I made three and decided it wasn’t worth it – despite the foot of fresh new snow that was a dream to ski in.) 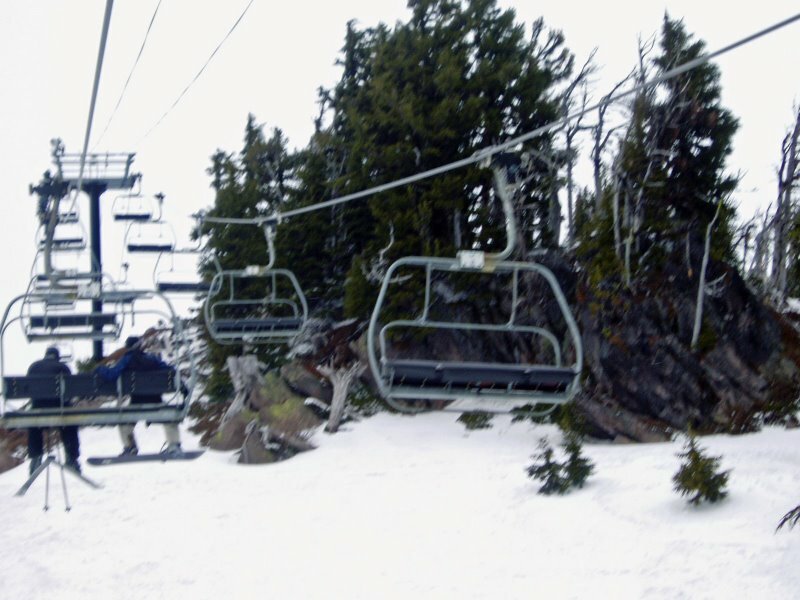 We heard later that Timberline didn’t even open due to the weather. Before we even got out of the parking lot, one of our party was involved in a rear-end accident when someone hit her from the back. This accident was most likely caused when another of our party swerved to miss an oncoming car and ended up buried in a snow bank. Our snow-bred Subaru made it home without incident – much to the chagrin of the kids in the back seat. I found out there are some Seattle-area ski resorts that are easily accessed from Columbia County and may even be closer than Mt. Hood. I’ll have to chaeck those out.